Can the Erie market support paintings with a high price tag? 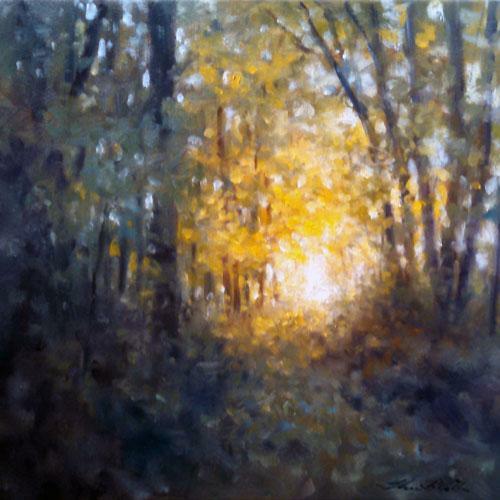 Thomas McNickle's 'Into a Clearing' oil on canvas. Before we get too far into this review, let me elucidate my overall opinions of Thomas McNickle and Glass Growers Gallery: I like them. Really, I do! If the previous statement sounds like I'm trying to atone in advance for a somewhat snarky and negative review, that's because I am. See, Thomas McNickle is a very talented painter and Glass Growers is one of my favorite places to explore, but the show currently hanging there has something wrong with it. But this problem has more to do with the state of art in America and Erie in particular and less about the art itself or the gallery. McNickle is a nationally-known landscape painter. In 2012, he held a one-man show at The Butler Institute of Art in Youngstown, Ohio. To give you an idea of how prestigious that is, The Butler is currently showing retrospectives by photographer William Wegman and recently deceased children's book illustrator Maurice Sendak – both legendary figures at the very top of their fields. McNickle even had a solo show at the Erie Art Museum in 2003. He's prolific, popular, and he's local (his studio is in the Newcastle area). So, we have a successful, local painter who makes beautiful landscapes – what's not to like? Sticker shock, that's what. This is Erie, Pa.: unfortunately the land of $1 happy hour draft beer and a place where you can't go for a walk in the county without tripping over a Walmart. As beautiful as his landscapes are, four grand for a 28" x 30" oil painting in this market is hard for me to comprehend. There is a forty-inch wide canvas titled Releasing the Day, which uses warm fuzzy late-day light to illuminate a cool summer marsh shoreline. It is evocative and bewitching. It is also $8,500. That's the price of a decent used car. For the sake of Glass Growers, I hope a couple of these paintings sell. The commissions would be great for them, allowing a gem of a local business to stay open and pay their wonderful employees. But who here is going to buy works in this price range? There are plenty of rich people in Erie, but precious few collect art – at least original paintings or sculptures created by professionals who make their living as artists. Many of the supremely-skilled artists in the Erie area are just scraping by because of a general lack of appreciation for their work by those who can afford to pay them what it should be worth. Many of the owners of the million-dollar McMansions that seem to constantly spring up in Millcreek are perfectly happy to decorate their walls with schlock they bought at the furniture store when they picked out their couch. Or they put a "limited-edition print" of a whitetail buck over their mantle, thinking that they've made a great investment because what is essentially just a mass-produced poster has a low edition number and an artist's signature. The few people who actually buy original art in Erie can't possibly have any wall space left. Economics 101: There is a direct relationship between the demand for a product and the price. As sad and pathetic as it is, the demand for original paintings in Erie, Pa. is low. Therefore, the price of said art is also low. If one wants to buy a beautifully-crafted oil landscape, there are several lesser-known painters locally that are every bit as accomplished at their craft as Thomas McNickle. These artists have not yet gained the fame of McNickle, so you'll pay one-third of the price for a painting by Joyce Perowicz, Jan Lutz, or Michael Camp. Heck, you could commission Erie's virtuoso of oil paint, Brad Lethaby, to do a custom piece and still save enough to buy a couch to put it over. The artists of Erie would benefit mightily if their work fetched a better price, but until then, it's a buyer's market, and people who want a bargain can find many.Maybe Erieites aren't cheap – we just know a good value when we see... oh man, who am I kidding? We are flat-out, unapologetically cheap. In some respects, that's not a bad quality to be known for. The cost of living here is low because of it. That's more Econ 101: prices here are low because that's what people are willing to pay. Merchants in New York City charge four dollars each for bottles of tap water and four grand a month for a one-bedroom flat because that's what the market will bear. The market in Erie is just not the same. Those quarter-million dollar condos on Peach Street are a great example of cost exceeding perceived value in our market: in many other cities, they'd be snapped up in a heartbeat. In Erie, they are priced way above their market value and will remain unsold and empty until their prices come down. If, from my perspective, all of McNickle's paintings are overpriced for our market, many of them still are wonderful examples of what can be accomplished by a master craftsman. McNickle's sense of composition is never flawed. The atmospheres he creates are often lush and vibrant. I particularly love the biggest painting in the show, The Foot Bridge. Four-feet wide, this cool forest tableau offers an opportunity to experience an evening's stroll through the evening woods without ever leaving the gallery. It has a particularly strong allure because of the limited pallet that McNickle utilized: All the colors and tonalities harmonize into a calming scene of quiet beauty. Other paintings in the gallery are less impressive though – and again, not worth the exorbitant price. Having been familiar with McNickle's work for years since taking a workshop from him in the '90s, I know what he is capable of, especially when he lets loose with his watercolors. Many of these oil paintings lack the conviction and delicacy he is famous for bringing to a canvas. Smaller canvases titled Pink Evening, Storm, and Pale Turquois Sky all feel like studies for larger paintings he may be producing later. One gets the sense that after McNickle finished a couple major paintings for this show; he scrounged around the studio for some finished rectangles just to fill the rest of the wall space. Kudos should be given to Deb Vahanian and Glass Growers for hanging a local Master's work downtown for us all to see and enjoy, but I'm afraid that is all that will be happening. It would be nice to think that someone in our town will drop the cash to take home one of Thomas McNickle's paintings, but with these prices, I'm not holding my breath. The Fields, the Woods, & the Marshes -Recent Landscape Paintings by Thomas McNickle runs from June 6 to July 22 at Glass Growers Gallery, located at 10 E. Fifth St., open Monday through Saturday 10 a.m. until 5 p.m. and Sundays noon until 4 p.m.